Bangkok, Thailand – 21/September/2017 – Six business events have been recognised by Thailand Convention and Exhibition Bureau (TCEB) and received their awards for outstanding performance in the first edition of Thailand MICE Excellence Awards from Thailand’s Deputy Prime Minister H.E. General Tanasak Patimapragorn (center) at an award ceremony on September 4, 2017 during the Thailand MICE Forum 2017. Four international trade shows in the small (less than 3,000sqm), medium (3,000–6,000 sqm), large (6,000–10,000 sqm) and mega (more than 10,000 sqm) categories as well as two mega events were honoured. VIV Asia by VNU Exhibitions Asia Pacific won the award in the mega size category for its absolute growth of overseas visitors, exhibitors, and space expansion from last edition. The 2017 edition of the biennial “feed to food” show attracted more than 45,000 visitors from 126 countries and almost 1,000 exhibitors with show size of over 22,000 SQM. Net. The awards in the large, medium, and small category go to Beyond Beauty Asean-Bangkok by IMPACT Exhibition Management (growth 81.31%), Thailand LAB International by VNU Exhibitions Asia-Pacific (growth 52.93%), and Asia Cold Chain by Manch Communications (growth 56.68%), respectively. These three trade shows were top performers in terms of compound annual growth rate of total international participants from past 3 consecutive editions. In the mega event category, Thai Game Software Industry Association’s Bangkok International Digital Content Festival received the award for “Best International Content” and Thailand Creative Design Center’s Chiangmai Design Week clinched the award for “Best Community Engagement”. 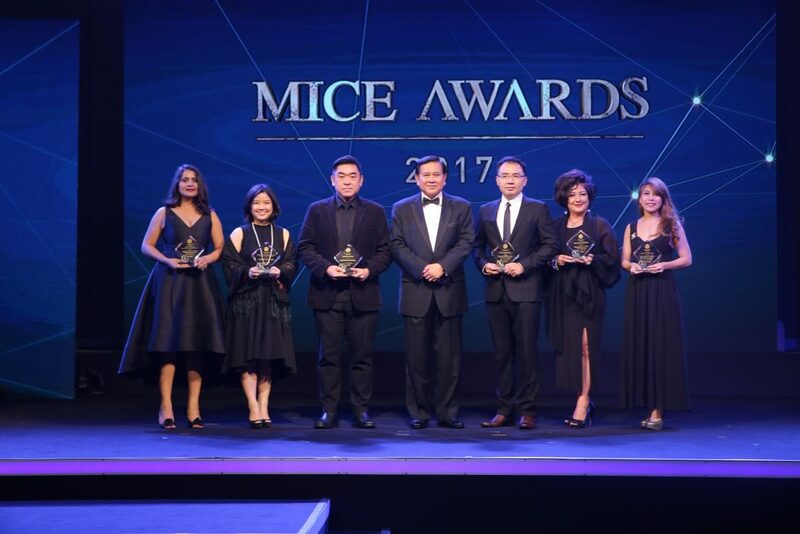 Thailand MICE Excellence Awards is part of the new Thailand MICE Forum established by TCEB to showcase Thailand’s business events industry and promote interaction and knowledge-sharing among stakeholders. Kiran Mittal, Managing Director of Manch Communications (Thailand) Co., Ltd. – The organizer of Asia Cold Chain. Tidarat Thanapakpawin, President of Thai Game Software Industry Association – The organizer of Bangkok International Digital Content Festival. Deputy Prime Minister H.E. General Tanasak Patimapragorn. Teerayuth Leelakajornkij, Director, Science & Technology Business Unit of VNU Exhibitions Asia Pacific Co., Ltd. – The organizer of Thailand LAB International. Pornphan Bulner, Director of IMPACT Exhibition Organizer, IMPACT Exhibition Management Co., Ltd. – The organizer of Beyond Beauty ASEAN Bangkok. Panadda Atthakowit, Senior Project Manager of VNU Exhibitions Asia Pacific Co., Ltd. – The organizer of VIV Asia. ไทยแลนด์ แล็บ อินเตอร์เนชั่นแนล... LAB Technology week attracts over 9,165 trade visitors!